Ultra-low sulfur diesel. Ultra-low sulfur diesel has 97% less sulfur than low sulfur diesel. The advantage to less sulfur is that the fuel burns cleaner and reduces harmful emissions from diesel engines. Ultra-low sulfur diesel can be used in place of diesel fuel in older and newer vehicles. As of 2010 all diesel fuel sold in the US must be ultra-low sulfur. Gasoline. Gasoline is used in many different types of vehicles and can be delivered right to your business, farm, or construction site. We offer E-10 and Conventional (non-ethanol) gasoline. Gasoline can also be used in generators, lawnmowers, and other equipment. Gasoline storage tanks can be installed at your place of business so that you can have access to gasoline onsite. #2 Heating Oil. When it comes to heating your place of business, heating oil may be the most efficient fuel source. And it can be delivered directly to you. Heating Oil in the US is labeled “#2” because it has to conform to certain standards. When heating large spaces such as warehouses and workshops, as well as small spaces like offices, heating oil is highly efficient. Kerosene. Used as a heating fuel as well as engine fuel for vehicles, kerosene is another commercial fuel that can be delivered directly to your place of business. Kerosene is an efficient, versatile fuel that can be used in many different ways. Having fuel delivered right to your place of business is not only convenient, but it saves time and money, which ultimately improves your business’s bottom line. Berico understands that having the fuel you need for your vehicles to run is crucial to productivity. This is why Berico provides reliable diesel fuel delivery, as well as other fuels, seven days a week. You and your employees can get to work on time and work as long as necessary to get the job done. Fuel delivery service is affordable with Gateco because of our competitive prices. Between getting a lower price for fuel and eliminating the need to go out and get fuel, your savings are multiplied. Berico has been serving Greensboro and the surrounding area since 1924. 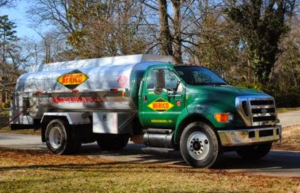 Generations of satisfied customers can testify to Berico’s quality fuel and dependable service. To get started with commercial fueling for your business, call (336) 273-8663. Feel free to contact us at inforequest@berico.com or 336-273-8663. We are also glad to send commercial customers our daily prices if you are interested.